In optical transmission network, multiplexing technology is considered as an effective means to expand the transmission capacity of existing optical fiber networks. It can increase the transmission capacity of optic fiber in the most cost saving way, so as to quickly meet the increasing demand for high bandwidth. Now, some multiplexing technologies have been widely used and mature in optical transmission networks. In addition, there are some new multiplexing technologies that have been highly praised. In this tutorial, we will introduce two kinds of multiplexing technologies – wavelength division multiplexing (WDM) and optical time division multiplexing (OTDM), and a new kind of emerging technology – space division multiplexing (SDM). In modern optical transmission networks, wavelength division multiplexing (WDM) and optical time division multiplexing (OTDM) are two mainstream multiplexing technologies, which will be respectively described in detail in this section. Wavelength division multiplexing (WDM) is a technology that uses a multiplexer (MUX) to multiplex optical carrier signals with different WDM wavelengths into one optic fiber on the transmitting terminal, and then using demultiplexer(DEMUX)to separate WDM wavelengths on the receiving end. Each WDM wavelength signal is independent of each other and is free from the effects of any transmission protocol and rate. Besides, wavelength division multiplexing (WDM) technology can also achieve bidirectional transmission of optical signals on one optic fiber. This tech virtualizes one optic fiber into multiple fibers. It does not only simplify the structure of the optical transmission network but also greatly saves the optical fiber resources, so as to reduce the cost of optical network deployment. According to the difference of wavelength, wavelength division multiplexing (WDM) technology can be subdivided into coarse wavelength division multiplexing (CWDM) and dense wavelength division multiplexing (DWDM), which are different in wavelength interval, wavelength number and so on. Thereinto, CWDM (coarse wavelength division multiplexing) is generally used to cover a small area of LAN applications, while dense wavelength division multiplexing (DWDM) technology is used to cover a small range of metropolitan area network applications. The deployment cost of dense wavelength division multiplexing (DWDM) system is much higher than that of coarse wavelength division multiplexing (CWDM) system. 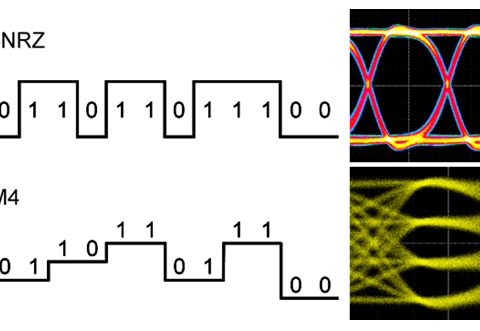 Optical time division multiplexing (OTDM) is a time division multiplexing and demultiplexing in the optical field. It converts optical signals in each branch into the high rate and ultra narrow short pulse signals, and then inter-plugged into an allocated time slot in the multiplexed channel, thus realizing the purpose of high-rate transmission. It is an effective way to overcome the bottleneck of electronic circuit bandwidth and to make full use of the capacity-expansion scheme of low-loss bandwidth. However, its technology is not mature at present. The mixed system composed of wavelength division multiplexing (WDM) and optical time division multiplexing (OTDM) technology can take advantage of each other’s advantages in the tech. It is with these advantages such as high utilization rate of optical fiber bandwidth, large system transmission capacity, simple construction technology, reasonable price-performance ratio and so on. It is the most efficient way to solve the multi-user communication network about the high speed and large capacity transmission of the trunk line. 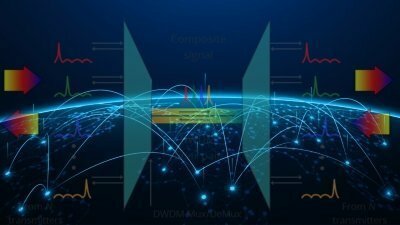 Space division multiplexing (SDM) is a technology that simultaneously transmits different data streams by building parallel space channels in space dimensions, generally used in multiple inputs and multiple output (MIMO) systems. Currently, space division multiplexing (SDM) is considered as an effective way to solve the bottleneck of current metropolitan network bandwidth. It can greatly reduce the communication cost and energy consumption at the same time of increasing the bandwidth of the MAN.